Anything left of interest in the movie theaters in the dreadful year of 2014? While I'm sure some of you are looking forward to the WW2 nonfiction drama UNBROKEN as a holiday release, the latest mind-bender from Christopher Nolan INTERSTELLAR and, I guess, CARS 3: CARS SAVE CHRISTMAS (Pixar sure has fallen, if you ask me), I recently got my abused eyes on the 105-minute import from Japan, DRAGONBALL Z: BATTLE OF GODS, released here direct to video. I will not pretend to be anything of a follower of the long-running Dragonball franchise, which encompasses comics, videogames, TV shows and, of course, movies - both theatrical features in the Far East such as this one and made-for-video specials. 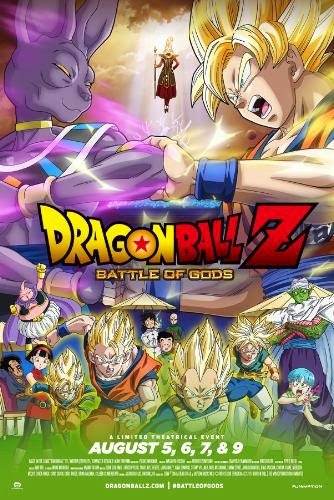 In fact, starting with BATTLE OF GODS may be optimum, as I can't simply see where this addictive franchise can go from here. The setup, as I can best understand it: A "Saiyajin" alien martial-artist named Goku came to Earth as an intended bad guy but has turned out to be this planet's major defender - surrounded as he is now by decades' worth of extended family, friends, former-enemies-turned-friends, and other talking-animal-ninja types. Goku's main preoccupation in life is to simply be the best martial-arts fighter ever, and he and his kind have been known to boost their strength to be "Super Saiyajin" to win especially epic bouts. Oh, there are the wish-granting Dragonballs, too, but by this outing they're just kind of beside the point. After Goku & Co. defeated one mighty enemy after another, Earth has enjoyed a prolonged state of peace. But in deep space there dwells the strongest creature in the universe, an Egyptian-cat-style god called Beeris the Destroyer, who has the ability to annihilate whole star systems on a whim. When Beeris awakens after years of catnapping to learn that something called a Super Saiyajin has dueled successfully against all opponents, his nature leads him to seek out Goku for a decisive battle himself. And if anything whatsoever annoys Beeris, he will destroy the Earth, as is his habit. Most of the spectacle, then, takes place on Earth at an overblown birthday celebration for an obnoxious supporting player, where the party-crashing god has to have a good time - or else. It's actually quite funny, probably far more so for viewers who have followed these characters for a generation. How the bewildered Goku approaches the practical matter of how to boost his powers to fight a god is handled about as satisfactorily as one might expect. They say it's the villains that make the Disney cartoons memorable. I'm not so sure of that, but in DRAGONBALL Z: BATTLE OF GODS the antagonist Beeris is a treat. Not a cruel, sadistic archvillain monster but a smart and principled god who seems like he could be a fun entity to hang around with, until he threatens to destroy your planet (at one point, with a game of rochambeau). And, without getting into details or spilling any secrets, the movie also contains an assertion that, in the DragonBall universe, anyway, an unborn human fetus is indeed a full-fledged person. Anti-abortion activists take note! Goku is on your side!